White House Apartments, Entrance. I’ll bet you didn’t know that it has a name: The White House Apartments. Note: I know that I was supposed to write a piece about the former Soviet TASS office at 431 Gilmour (now the Gilmour Inn), I have decided that my own apartment deserves a bit of a spotlight. Outside of a brief year living in an architecturally-similar walk-up in Vanier on Deschamps St. in 2006, I’ve not lived in a building that has seen so much action. Of course, it goes without saying that it’s much nicer when you’re not part of that “action”. It is therefore fortunate and wonderful that the building, as it exists today, it silent, clean and the landlord is attentive, professional, and a source great conversation to boot. 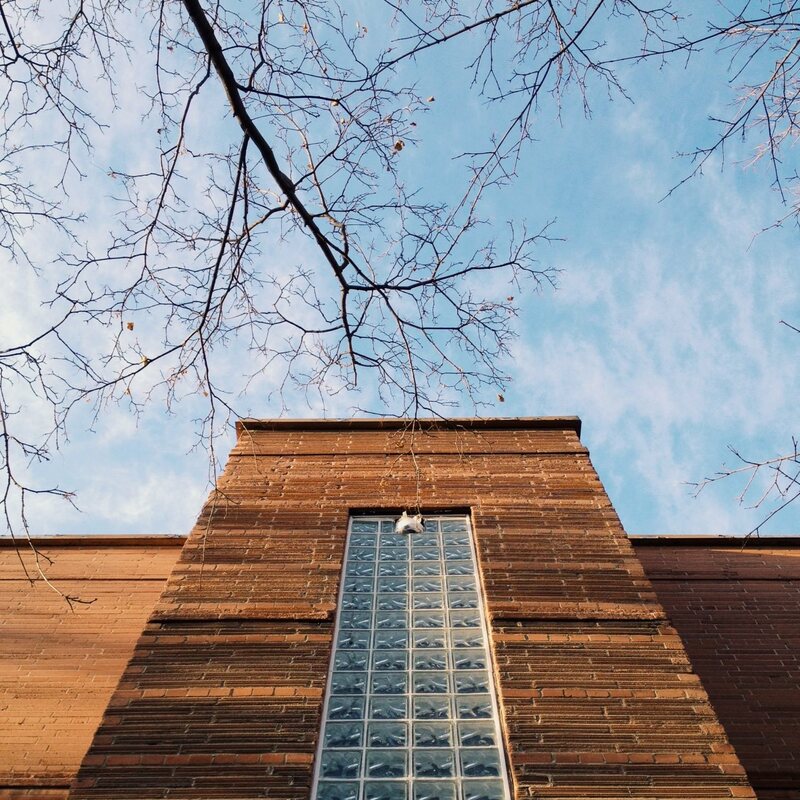 In urban life, it is quite often the most nondescript buildings that have the greatest number of stories to tell. To be certain, they’re not normally the most profound, important, or grand of tales, but they certainly make for some interesting narratives all the same. As the histori-dork that I am, I tend to research every apartment that I have moved into, searching for interesting events, well-known people, and the most run-of-the-mill information such as how much it cost, when it was constructed, for whom it was constructed, and – if available – the architect. In nearly all cases (9 of 11 places), I have come across at least something of interest. When I moved into this apartment at 161 Somerset West in September, however, I did not think that I would find so much that wouldn’t be out of place in an action movie or at least a network crime drama. Mrs. White appointed to the Milk Board of Ontario. Source: Ottawa Citizen, February 21, 1940. Much like the Mackenzie Apartments at McLeod and Elgin or the Harmon Apartments on Elgin, the White House Apartments were named after the owners of the home which previously occupied the lot. In this case, it was well-known local, Walter Russell White (1883-1961). Russell (as he was better known) spent most of his career working in the surveys division of the Department of Indian Affairs. Adding to his profile in social circles, he was a member of the Doric Lodge, the first president of the Ottawa Property Owners’ Association, active in the Ottawa Hunt and Curling clubs, and an upstanding and popular member of the Chalmers (now Dominion-Chalmers) Church. His wife (Eva Alma, but always in print, “Mrs. W. Russell White”. Thanks patriarchy) certainly made a name for herself. She was featured hundreds of times on the local social pages, was exceptionally active in the city as the president of the Local Council of Women, and in 1940 was appointed at the official consumers’ representative on the Milk Board of Ontario. Probably a function of the anonymity of the Civil Service, a search of the Journal’s database for “W. Russell White” yields 289 hits, the vast majority are in reference to her. While her name and good standing may have been anchored to him, it is her public profile that looms larger today. On the whole, the family enjoyed a high profile locally and their son David even featured in the papers for thwarting a young purse thief in the summer of 1940. David would later be sent overseas with the Algonquin Regiment to fight in the Netherlands. CENTRAL., ground floor, available July 1. Suite 3 adults, each will have a private bedroom and share large living room, kitchen, bath and verandah. At $45 each, including electricity. Apply on premises, 161 Somerset St West. Detailed advertisement. 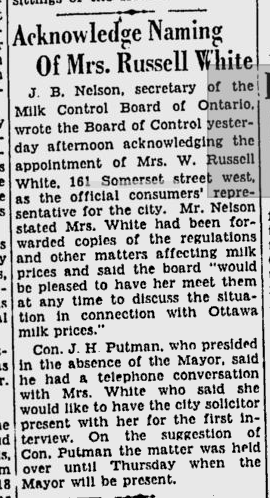 Source: Ottawa Journal, July 24, 1957. In the Spring of 1957, the advertisements changed. The subdivided family home was demolished that year (it remains visible on the 1956 Goad’s Fire Insurance Map) and a new walk-up building consisting entirely of bachelor units was constructed (twenty-eight in total, as it remains today). In an environment of high demand for rental units, much like the building at 92 MacLaren, this one also rented out quickly. As with the MacKenzie Apartments on McLeod and the Harman Apartments on Elgin, this one was named for the most recent (and likely then current) owner of the property whose home (or business, in the case of Miss Harmon) it replaced. One point of interest is that using the Bank of Canada’s inflation calculator, it is clear that the current rents charged in the building are generally in line with inflation. This is somewhat unlike 1 or 2 bedroom units which have tended to run at least somewhat ahead. As the rental apartment field became more competitive, later advertisements for the building tended to highlight other amenities, such as the parquet flooring (still present), tiled four-piece bathrooms (still present and awesome – mine’s pistachio tiles with black trim), and a shared television antenna (not present, but in this time of digital OTA, would be very much welcome). 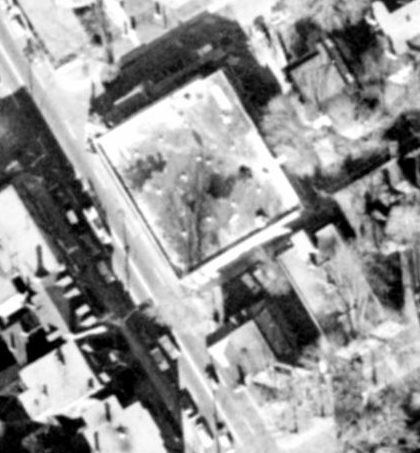 1958 aerial shot of the block. The large building is the then nearly-complete Elgin IGA (Goldstein’s, now Dollarama). The structure at the corner of Elgin and Somerset is where the TD Bank stands today (constructed in the mid-1960s), and of course, the shiny new White House Apartments directly behind it. McKay shot in the alleyway. 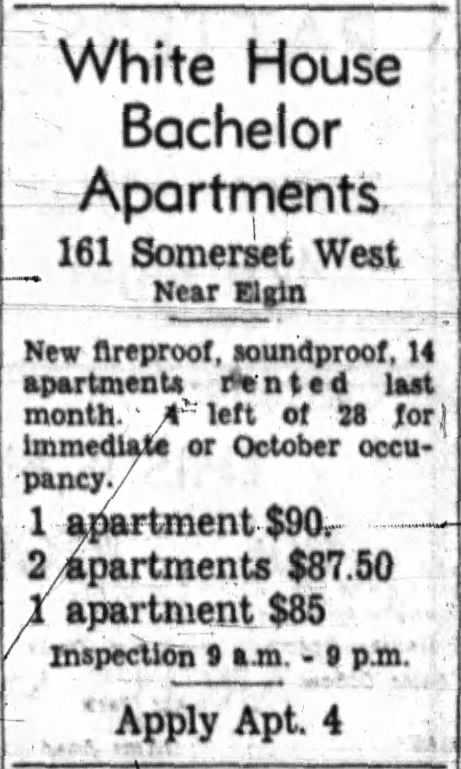 Source: Ottawa Citizen, November 1, 1968. Like a large number or urban areas in Canada during the late 1960s, Centretown came to experience some turbulence. The sorts of activities we tend to associated with certain other parts of the city were present in the area. 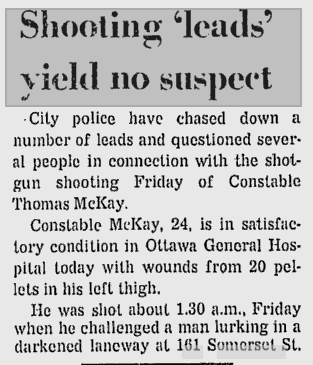 For example, on a cold October evening in 1968, Constable Thomas McKay of the Ottawa Police was walking his beat when he noticed a man wearing a white trench coat lurking in the alley between the apartment and the IGA. When he approached him, the man (Eugene Tanguay, of no fixed address) fired on him with a 12-gauge shotgun. The Crown filed charges of attempted murder, but Tanguay’s defence Counsel, Arthur Cogan (who is still practicing today) successfully had him acquitted. The jury found McKay’s testimony to be inconsistent. The Journal reported that he still had most of the pellets were still in McKay’s leg a year following the incident. Things appeared to calm down following the incident. The building’s residents went on with their lives, winning small charitable raffles and students winning awards for academic achievements. In 1975 that all changed due to the actions of two of the building’s tenants: one for a string of armed robberies and one for his role in alleged international drug smuggling and gold heist plots. I’ll deal with these in order. Demonstrating that perhaps no matter how well set our tables in life are, we’ll sometimes find ourselves sobbing underneath them is Richard Soper. Unlike Eugene Tanguay above, Soper was born into privilege. His grandfather was none other than Ottawa Electric Railway Company co-founder Warren Y. Soper. With the family money and his own reasonably successful photography business, it’s not likely that troubles were expected. However, in 1975 at age 50, his considerable inheritance had been spent, his marriage failed, and he began to drink excessively. To get money he began to rob local banks, beginning shortly after the New Year. In an eight week span, he robbed four local banks – all on a Friday afternoon when things were calm, earning the moniker of the “Friday Afternoon Bandit”. He was busted in March when Ottawa Police Constable Ted Kacsynski found him asleep in a stolen car parked in the Unity Bank parking lot at Elgin and Gloucester with a gun, a holdup note, and a fake beard in his possession. 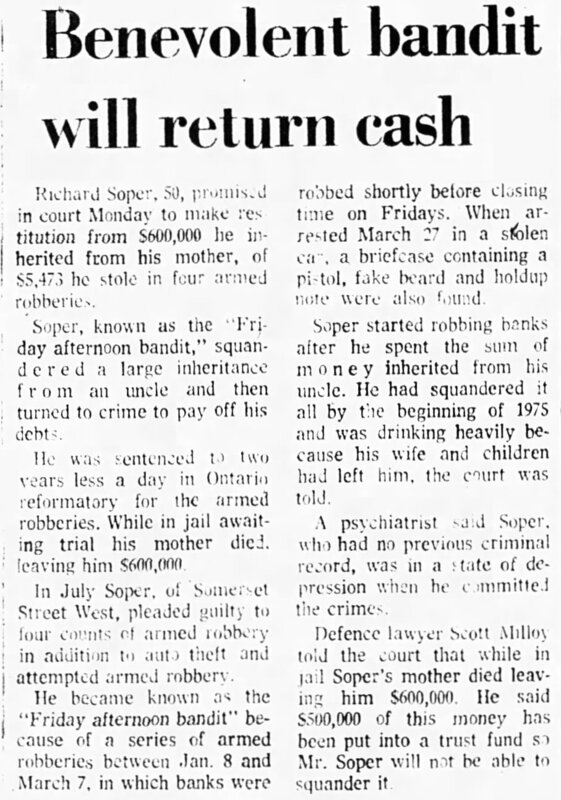 Richard Soper, the “Benevolent Bandit” Source: Ottawa Journal, September 23, 1975. 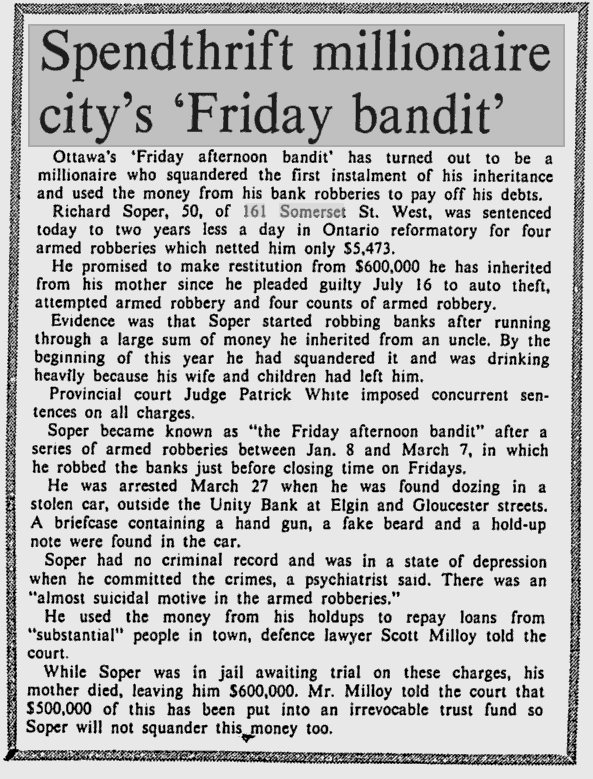 Although it is probably somewhat inappropriate to suggest, Soper was therefore somewhat lucky that his mother passed while he was in jail awaiting trial. She left him an inheritance of $600,000 (about $2.5 million today), but $500,000 of that was in an irrevocable trust. She was obviously quite aware of his expenditure management issues. With this inheritance, he was able to easily make restitution (the four robberies netted him only about $5500 in total). For their own part, both the Citizen and the Journal didn’t seem to take his armed robberies particularly seriously: the Journal identified him as the “Benevolent bandit” and both papers stressed that he was depressed when he committed the armed robberies. During his trial, it was revealed that he suffered from a disease that has been known to afflict the upper classes short on lucre: he needed to repay “loans from ‘substantial’ people in town.” It has, after all, normally been the case that one does not descend the socioeconomic ladder willingly or easily. Provincial Judge Patrick White (no immediate relation to the White family described above that I could locate) sentenced him to two years less a day in light of his mental state and his lack of previous criminal record. The Citizen characterized him as a “spendthrift millionaire”. Source, Ottawa Citizen, September 22, 1975. The White House didn’t only appear in the news during 1975 for Soper’s indiscretions, however. Another of the building’s tenants was one Charles Gaul. Without inventing some sort of biography, Gaul’s upbringing was considerably less privileged, but was no means anonymous. Gaul’s name was a common feature in the the local papers, but unlike Soper, whose portraiture business made his name common in the papers, Gaul’s was published frequently for his rap sheet, which grew rapidly through the 1960s and 1970s. For example, at the tender age of 19 in 1961 he plead guilty to driving without a permit and fleeing the scene of an accident, for which he was chased into Hull by “three Hull motorists and Hull Constable Gilles Froment.” Later that year, he was picked up for possession of stolen goods and of housebreaking tools. The following year he was sentenced to 75 days for theft. In nearly all of the reporting on his crimes, reporters had a different address and more often than not, it was no fixed address. And so it went. By 1975, however, it was clear that Gaul was on to more substantial crimes and involved with some fairly unsavoury characters in their own right. As Soper was nearing the end of his tenure as a criminal, Gaul appeared to be ramping up his efforts. In the March 5, 1975 edition of the Journal, it was reported that Gaul was a co-conspirator with one Patrick Mitchell in the importation of hashish. 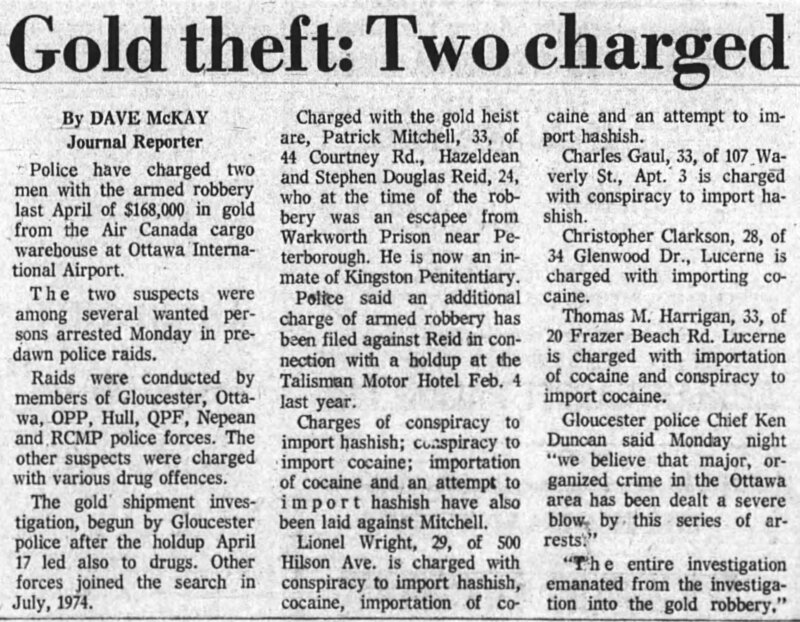 Mitchell, for his own part, was arrested in the same investigation for an armed robbery of $168,000 in gold from the Air Canada Cargo warehouse at the airport (it was destined for the Mint). Other co-conspirators were also charged with importing cocaine. This seems to have been the beginning of the end for Gaul, however. Gaul involved with crimes larger than the petty thefts he was previously involved in. Source: Ottawa Journal, March 5, 1975. Charles Gaul, 33, was found in his apartment at 161 Somerset St. West at 5:30 p.m.
His girlfriend became concerned when she didn’t hear from him for several days and went to his apartment with the building superintendent. They found his fully-clothed body lying on the floor near the entrance to the apartment. He had been dead for several days. Mr. Gaul was one of the eight men named in indictments signed earlier this month by Justice Minister Otto Lang alleging three conspiracies to import narcotics into Canada. 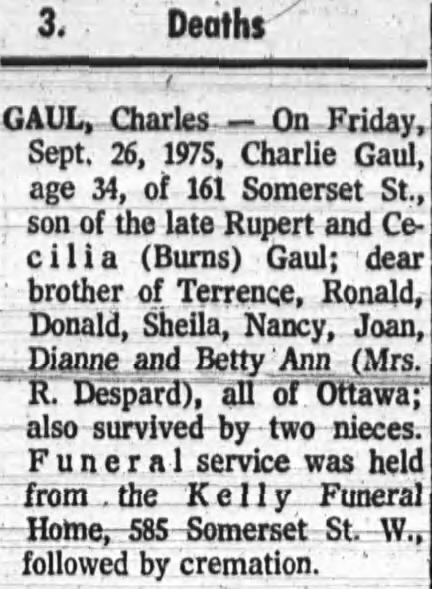 Gaul’s death notice, published in the Journal, October 1, 1975. It was on the following day that Ottawa police reported that it was most likely that he died of an overdose and had been dead for around a day before he was found. The Crown proceeded with the trial that was due to begin on October 6. The media circus surrounding the case caused the Ontario Supreme Court to change the trial’s venue to London. When I described Gaul on my #didyouknowseries entry on Instagram as “small potatoes”, it was clear that he really was. He may have even just been useful to the real mastermind behind the heist: Patrick “Paddy” Mitchell. Even Mitchell’s lawyer suggested that Gaul and the others caught up in the drug trafficking scheme were duped. If Mitchell’s name sounds familiar, it should. He was the leading member of the infamous Stopwatch Gang. At around $15,000,000 in a total haul, they were arguably the most successful North American bank robbers in recent memory. For his gold heist and cocaine importation scheme, Mitchell was sentenced to twenty years (he quickly escaped from prison by feigning a heart attack). It is, of course, way beyond the scope of this piece to recount their deeds and misdeeds. Given that both Mitchell and Gaul were of a similar age, were of a similar class, grew up in the same area (Preston-Lebreton), they were likely at least somewhat acquainted before that first big score in 1974. The gold from it (actually valued at more than $375,000) was never recovered. If you’re interested in the activities of the Stopwatch Gang and its members, including Paddy Mitchell, he was not only a regular blogger, but the National Film Board produced a short film about his accomplice , Stephen Reid entitled Inside Time. Following Mitchell’s death (from Lung Cancer) in 2007, a large amount of material was produced on his exploits and is easily located online as well.